I went through a period a few years back, reflecting on my life, and for all the regrets, how I still felt I would choose it again, or even more, that I had no choice. I am what I am. Though I’m trying to explain what is is that has driven me to live as I have, though I can’t explain, because there is no reason, but there is something that drives me, haunts me, all my life. 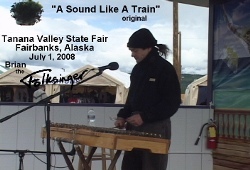 I play it this time with the dulcimer on the State Fair Main Stage. It is like the sound of a train, when you have travelled, and even as you sit somewhere comfortable, you here the sound of the horn far away, calling up memories, calling you back to that life. Like the sound of the sea to a sailor, or the smell. When you have lived anything both deep and intense and still out of the ordinary, and a sound, or a smell, can call you back to it, despite how safe and comfortable you might be, you are driven to seek that intensity again. But in the end, I am not talking about something so simple. I say it clearly, a sound like a train, not the sound of a train. All my life I have heard something, felt something, known something that is like the sound of a train. If you have ever heard one up close, the sound of a train is a sound that spans from subsonic rumbles to high pitched squeals and dings that scale up and away beyond the range of hearing. It is a sound that shakes the ground and you feel inside you as much as outside you. It is a sound that is overwhelming, and you can feel it travelling through the ground, or carrying in the air even when you are miles away. And there is sound like that, except I do not hear it with my ears, but in my heart and soul, in my spirit or mind. It shakes my bones and scales up past where even those senses can reach, and it reaches me wherever I might be, whispering as quietly as a train miles away on a still night, or like a sudden clap of thunder. And those of us who hear it can’t explain what it is like to someone who doesn’t. It is a calling, though I can’t quite say for what, but to follow that life of the heart and soul and spirit. To seek that intensity of life in that super-aware, super-sensitive state of being, playing music, in the intense and often terrible beauty of nature. No I can’t really explain, can I? That I gave it all up, all the dreams and plans, all the fine things of life, all the hope of love, all the warmth of friends and comforts of home to seek this life I can’t explain, a hard life, physically, and racked by emotional storms facing a world as it is, without armor, with every nerve and sense open and aware, often just trying to survive, like a sailing through a storm at sea, driven by something I can’t explain. Though my friends understand, I know they wish I would settle down, maybe find some happiness, but I think they also know I am driven by something I can’t escape or explain. Though it drives me to be a folksinger, certainly, to sing the songs, of love and peace, of freedom and justice. And yes, when I can’t go on, and I am finally gone, I will be part of that sound, in every sound, in every song, in that sound like a train. This entry was posted on Friday, August 8th, 2008 at 12:45 pm	and is filed under Music. You can follow any responses to this entry through the RSS 2.0 feed. Both comments and pings are currently closed.